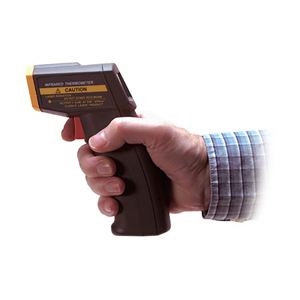 The new portable, low cost OS540 infrared thermometer series offers solutions for many non-contact temperature measurement applications. This unique handheld infrared gun offers a powerful feature with a circle or dot laser sighting. IDEAL APPLICATIONS include: Diesel and Fleet Maintenance, Electrical, Asphalt, Measure Ink and Dryer Temp. (Screen Printing), HVAC/R Automotive, In-Process Temperature Measurement, Fire and Safety. 참고: Comes with 9 V battery, wrist strap and laser circle to dot switchable sighting, and a complete operators manual.